The Colorado Historical Society, which operates the existing museum at 1300 Broadway, is being forced to move because the state's appeals courts next door need to expand. 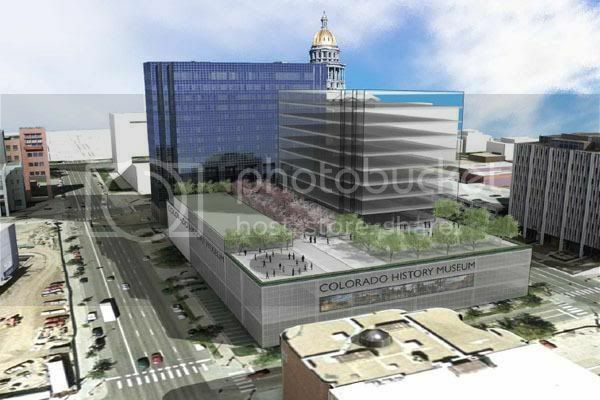 Officers of the Colorado History Museum have signed a preliminary agreement to build a new museum just a block away, in a vacant parking lot on 12th Avenue between Broadway and Lincoln Street. Cool - I love history museums. Have you been to the current location of the Colorado History Museum, yet? It may be on my agenda as a place to go with the kids when I'm out there in July. I've never been to it. I know for sure we're going to go to the DAM and to the Zoo. Sweet. Right in the Civic Center Park area across the street from the art museum. I'm not sure where the current history museum is located, but I love that Denver is clustering all of it's top cultural attractions in one area. The civic pride in Denver is fierce. When the lack of community spirit down here starts to get me down, I head up the road to soak in some of the positive energy that Denver is teaming with. Down here, it's "me, me, me, and leave my money alone liberal commies" Up there it's, "we are one, and let's work together to make this a great community for everyone." Denver is what a city should be. That's what I'm looking forward to. I guess Greenville is similar to COS in that regard. The people here, for being so outgoing and friendly, are literally quite selfish and have that same "me, me, me" attitude when it comes to taxes and funding essential infrastructure things such as quality public schools, good roads and mass transit. Thanks to some very strong leadership in Greenville's City Government combined with strong community leadership and "drive," a lot of this selfish attitude has been overcome for the betterment of the community, but by and large, individual people here don't want to spend a dime more than they have to in order to do their part to improve the overall whole...and the tax burden here is already among the lowest in the nation. That's essentially why we have come to realize after several years that we don't fit here...Denver is definitely looking more and more like it's our kind of town. Yeah. I'm fortunate to be an hour away if I need to get away from these people. What keeps me here is my family, and the good people. There are good people working hard to overcome the anti-city attitude and make Colorado Springs a better place. I have such a love-hate relationship with my home town. I guess I have this sense that in the end, common sense will win out over greed and extremism. Maybe I'm wrong... I hope I'm not. I also think there has to be a way to get things done with limited government funding. I'd be interested to see people come up with new and unique ways to fund projects without the use of tax money. They say it can't be done, but I think it probably can... most people just aren't willing to put in the work. The new history museum has been under construction for a few weeks now.